Joe Zeff Design is a boutique agency that works behind the scenes to help the world’s biggest companies tell better stories. 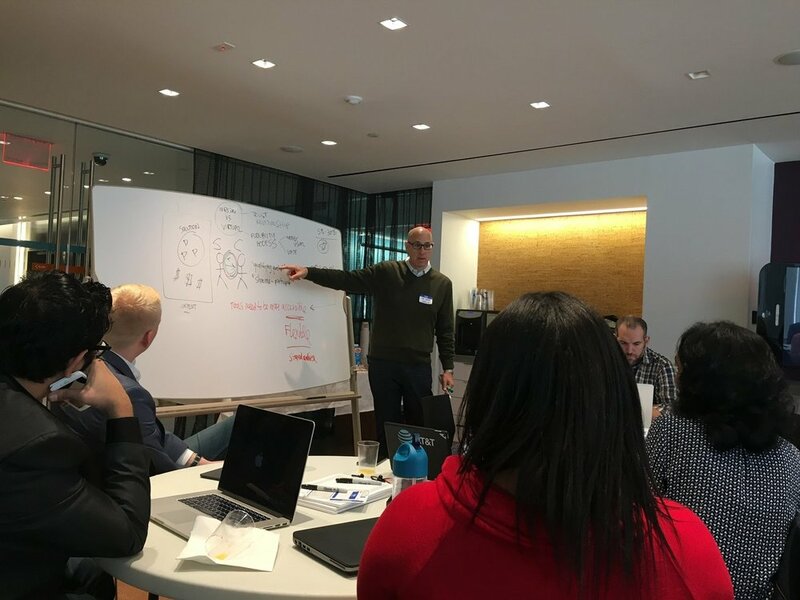 We create stories that help people understand — employees, customers, investors, attendees — applying skills developed as a journalist at The New York Times and Time magazine and as the founder of a creative agency that made some of the first successful iPad apps. We create stories that replace words with conceptual imagery, animations and interactive content. Some examples. We create stories that connect things that don’t naturally go together — disparate products, services, ideas, bullet points on PowerPoint slides — so that one flows smoothly into another. We create stories that come to life on screens, custom-built for pitch meetings, presentations, conferences, briefing centers, websites, touchscreens, training modules, and more. Like this. Below, three case studies. We can’t show the work, but you’ve probably seen it elsewhere. And more likely than not, you’ve encountered some of the same problems our clients asked us to solve. Problem: Large company with national sales team that sells a gazillion products. Products are technology-oriented, and often hard to describe. Sellers too often focus on standalone products that they know how to explain, rather than integrated solutions that combine products and result in bigger deals. Solution: Interactive sales tools that show renderings of typical customer environments — retail store, hospital, factory floor, etc. Seller can tap anywhere on the scene to highlight a potential benefit, as well as the products that deliver that benefit. Easy to use, so the customer can drive the experience. Delivered on tablets so the seller can present anywhere. Results: Consistency as each seller tells the same story, with flexibility to go in different directions depending on the customer. Presentations have become conversations, yielding unanticipated opportunities that surface as the customer gets talking. Tools have grown beyond sales; now used for conferences, as an event-friendly way to engage passersby, and training. Problem: Large company has 15 products that do similar things, the result of mergers and partnerships. As a result, it’s hard for salespeople to differentiate one product from another, and to quickly explain how the company’s set of products differs from the competition. Solution: Interactive sales tool that shows common threads running through their products — ease of use, technology, reporting — alongside a customer journey that presents each product in context. Non-linear format that allows the seller to jump to specific products or personas, to tailor each pitch to the audience. Animated diagrams that make points more quickly and effectively than words on a page. Result: Once again, consistency as each seller tells one story, and conversations that yield unanticipated rewards. Greater efficiency as more sellers can be quickly onboard to deliver authoritative pitches that customers can readily understand. Problem: Large company competes for building contracts worth hundreds of millions of dollars that are ultimately decided by 45-minute, in-person presentations. Their qualifications are exceptional, as are their personnel, but most lack experience speaking in front of an audience. Solution: On-site presentation coaching in which the team is gathered to identify key points, prioritize messaging, surface themes and relatable examples, develop a storyboard and assign speaking roles. Result: Presentations that succeed, helping the audience clearly understand what makes the company special, what makes the company different, and what makes the company best-suited for the project for which it is being considered.